A neckerchief is a small square scarf made of cotton, silk, polyester, linen, rayon or blends of those fabrics. The bandana is a type of neckerchief. Neckerchieves are once again on trend, and my guess is that they’ll stick around and become a classic. They are a nice way to add colour, interest and dimension to your outfit in an easy and affordable way. Neckerchiefs are usually small, but larger squares allow you to create a slightly different look, which I’ll highlight below. Make sure you tie the ends in a square knot so that they lie flat because your scarf looks neater that way. Neckerchiefs were made for longer necks, but shorter necks can wear them too. 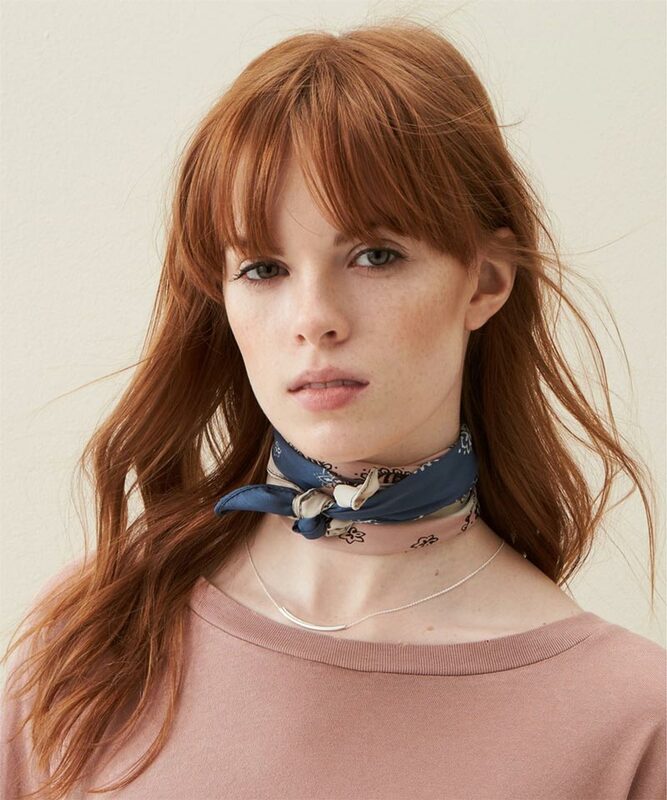 Simply tie the scarf looser around a shorter neck, and wear a colour that is low contrast to your skin tone to break up the cutting horizontal line. 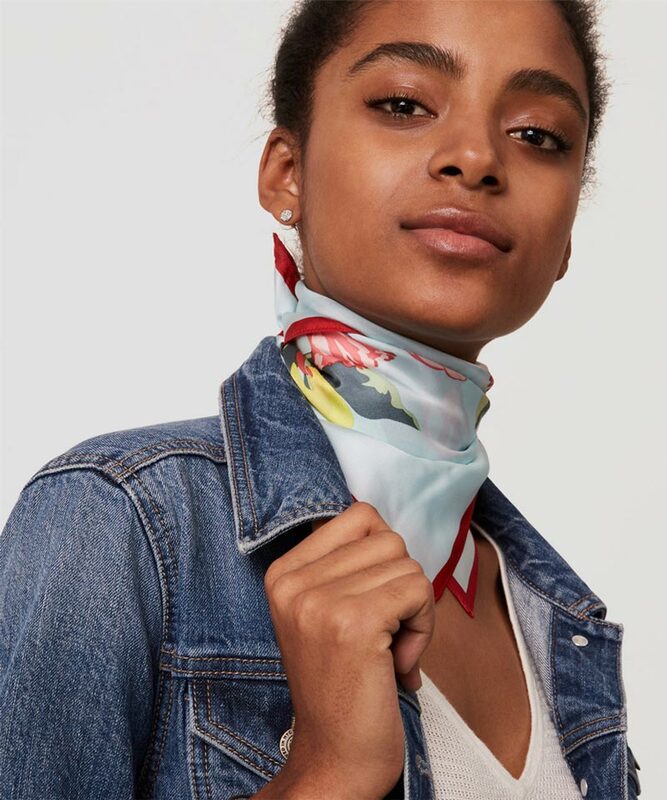 This is the easiest and most popular way to wear a neckerchief. Fold the points of the scarf together to create a triangle, and fold again and again lengthways to create a worm. Tie around the neck with a square knot. Position the knot in the middle or to the side of the neck. A larger square has longer ends. You can move the knot to the side, and push one of the ends to the back of the neck when they’re long. 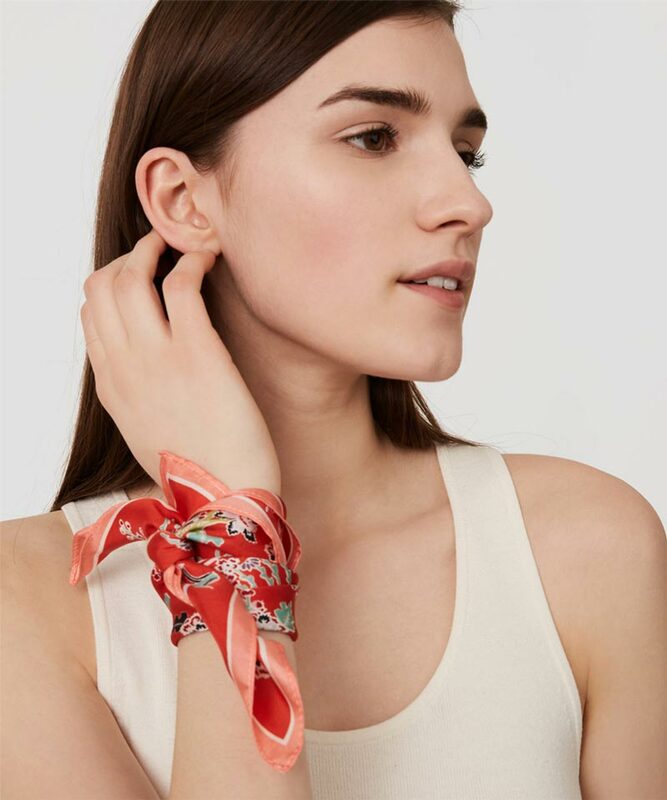 This is the trendiest way to tie the neckerchief at the moment. Fold the points of the scarf together to create a triangle and tie the ends into a square knot around the neck. Pull the triangular part of the scarf to the front or slightly to the side “cowboy” style, with the knot at the back. A larger square creates a larger triangle. 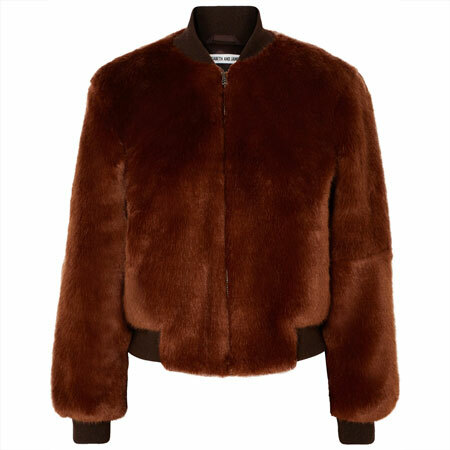 Try the look with a low-contrast colour to your skin tone if you need to get used to the vibe. 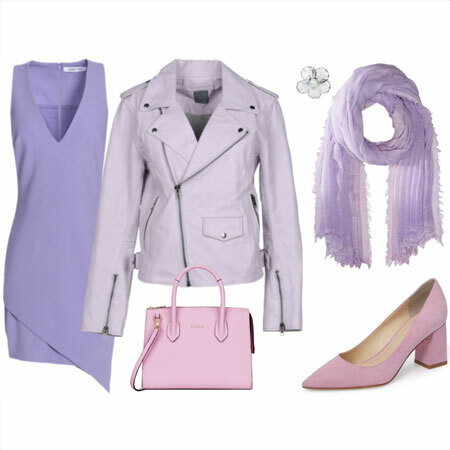 You’ll need a larger square scarf to achieve this look. Fold two points of the scarf together to create a triangle, and keep on folding to create a long worm. Wrap it around the neck twice and tie a square knot, positioning the knot in front or a little to the side. 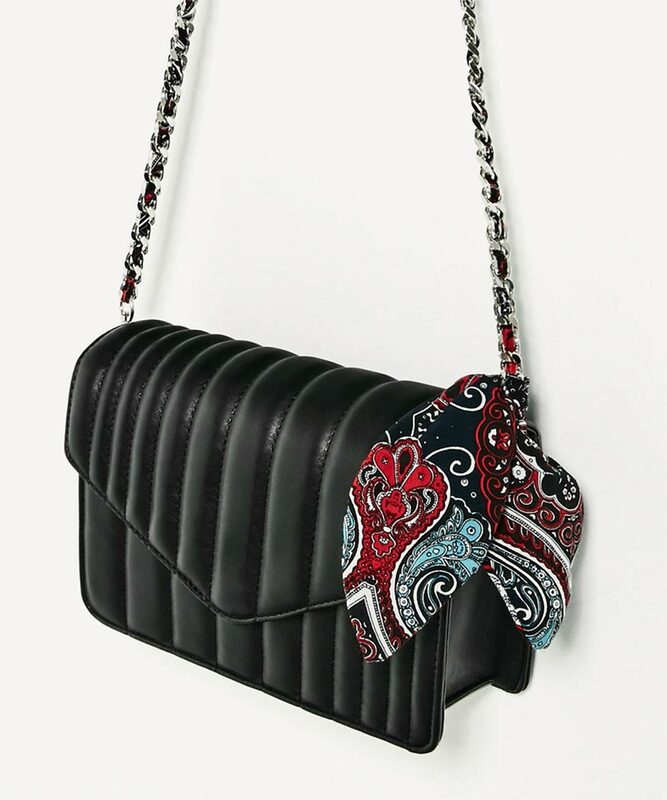 Tie a neckerchief to the strap or handle of a handbag. A smaller square scarf works best for this. It’s a great way to wear a scarf away from the face. Fuss-free, and adds patterned interest to your outfit. And last, another way to wear a neckerchief away from the face. Wrap a small square scarf around the wrist a few times after folding it into a long worm. The knot should finish on top of the wrist. A silky scarf tends to feel the most comfortable for this, although it might be a little tricky to tie on your own. 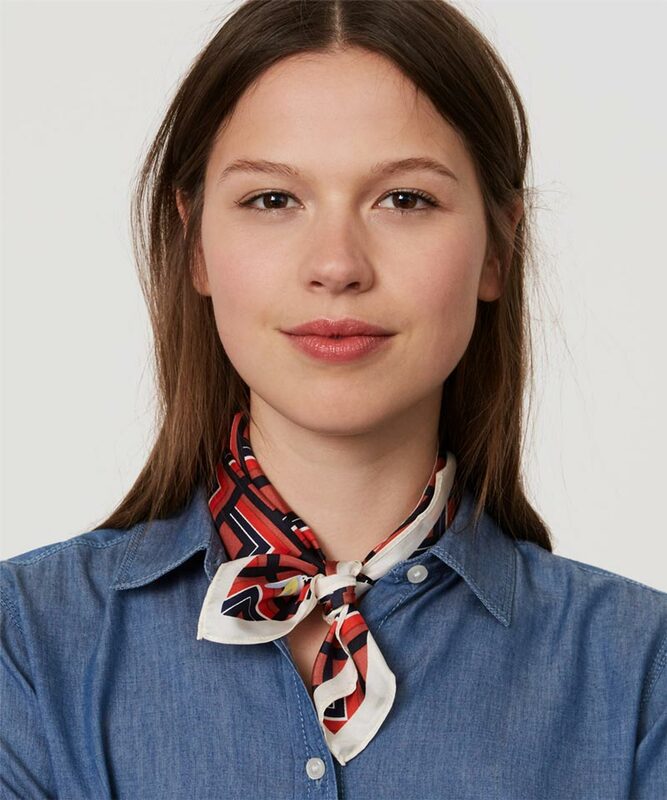 I bought a Spring neckerchief from the Loft last week, and have worn it a few times with J.Crew’s cashmere tees in the same palette. Personally, I prefer silk to cotton neckerchiefs because they look dressier. I like to wear my neckerchief tied the classic way, but with a strand of chunky pearls for a Modern Retro touch. With my green specs, the effect is quite Maximal. I’m also going to tie a neckerchief to the handle of my bag, just for fun. Wow, Angie you look adorable, to me it’s the best way, I like with pearls wonderful. Appreciate the tutorial, Angie. I can always use help with a scarf. This would be a spring/fall look for me as warmth is needed in winter and humid summers demand air. I’ll wear them more loosely, as my neck runs a bit short. Fun to see the arm and bag options, too. I like the classic look. I agree with Eliza. This look has limited use because I would get too overheated during the Spring/Summer months. You look gorgeous wearing your new neckerchief, Angie. The colors are perfect for you. I am a big fan of neckerchiefs/scarves and wear them fairly often. I have a couple of nice silk ones, but will be looking to add to my collection as I am trying to find specific color combos to tie items in my wardrobe together. I have been mostly wearing them like in #1 and #3, but looking forward to experiment with other ways, too. You look so pretty and fresh in your neckerchief and pearls, Angie! Lovely, lovely, lovely. Audrey would approve. I have lots of larger scarves and one silk scarf that qualifies as a large neckerchief. I like to wear it “cowboy” style. It does slide quite a bit, though, which is a bit of an issue. I would like to get a couple more. I haven’t been wearing my scarves as much this year and I think it is largely because I need a new shape/ new way to wear them, i.e. a refresher. Fun! I do this often just to add interest to my outfit. Most often I wear it like 1 and 5. Your neckerchief is so pretty! I love the border and you’re gorgeous! I just wore one on Friday and was unsure how my knot turned out. I may try to post a picture quickly on the forum today to show you. My work climate is all over the place and I figured if I wasn’t warm enough I could put my outer scarf on as I matched it to my outfit. I’ve worn one the first two ways and the last three (it’s been a while since the long hair and the wrist one) and I’m very intrigued by the third way with the double wrap. I want to do that soon! You are radiant in your pearls and scarf – love! A dear friend from Perth sent me a lovely handbag with scarf tied to the handle for Christmas – I’m set! Very cute! I like the wrapped version best – and many of my scarves start the day on my neck and wind up as bag candy. I’m so excited scarves are back. I love them. I also have a wonderful collection of them (many vintage) thanks to my mom and husband’s grandma. Even when they were not trending, I’d wear one on occasion because they make me happy. This is one of my favorite spring trends. Yours is lovely, Angie! I would do the headband method. That’s probably my favorite one and the one I have enough neck for. I have a lot more scarves than neckerchiefs and have always had a hard time wearing them. 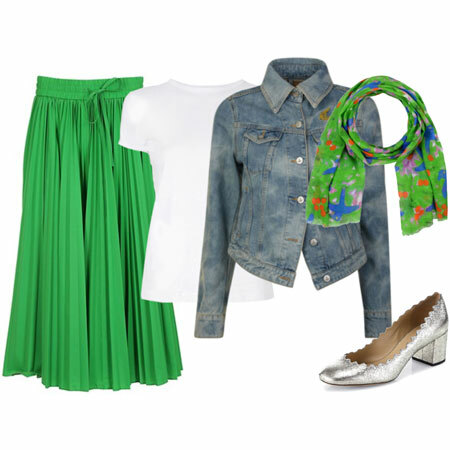 I do like these looks though, the wrapped look is cute and I could definitely do the wrist and bag looks. I tried on that same neckerchief this week, Angie! The way you have styled it with jewelry makes it extra fab. I’m looking for the slightly larger square. I think the “scale” is better for me, and there are more options for styling. It’s a great look for spring! I have one smaller silk square I love and one vintage Hermes that I am dying to wear more. I’ll have to experiment with the larger one as #3 above looks a bit strangled to me. Yay! Like Alecia I have several small square scarves and wear them year round but mostly in summer. If you use a cotton scarf, soak it in cold water, ring it out well, and put it in your bare neck, it cools for hours. I wear them more like a necklace, starting out like #1, but twisting it into a rope before tiring the square knot at the back of the neck. It looks more like a necklace and does a good job helping to fill in wide summer necklines. Among older friends, these scarves are considered my statement look. If the rope of scarf is longer than I want, I tie a large knot in the center (front), sometimes adding additional knots on the sides. I like a scarf around the neck for it’s extra warmth, and for camouflage (I have a mark at the base of my neck that sometimes gets commented on). I wore my red cotton neckerchief tied like #1 with a white button down and jeans last Friday. I like your layered look with pearls A LOT! Thanks for the inspo! This was perfect as a way to nudge me to get a silk scarf out of my closet and around my neck. I’ll have to play around with the tying options here to see which one works for it. Thanks for the idea Angie! And your new scarf looks beautiful and perfectly matches the cashmere t. I always adore a matchy matchy look. I forgot to add that I really like your scarf combined with your pearls and need to try that. I’ve never been able to get the “hang” of wearing scarves, except when they spare truly needed for weather purposes. (Especially summer heat – the damp cotton scarf is a lifesaver!). But mostly, I find they are either too hot, annoying, snag on things, etc. I do like to tie one on a bag, though that often feels a little “overdone” to me. Heh. As a short necked person I don’t think I’ve ever worn a real neckerchief except as bag candy. ;). I do sometimes wear small triangular shawls bandana style (tied very loosely) though. It’s not quite a neckerchief (too large) but sort of a similar style. Bag jewlery, wrist cuff, and headscarf. I would love to wear one around my neck but I have a short one. Oh well I can admire it on others. So many different ways to wear one. You look great in yours by the way. Glad the tutorial was helpful, ladies. Mirjana, I appreciate the kind words. Eliza, tying the scarf a little looser for a shorter neck works wonders. Sterling, a neckerchief is comfy in a/c in the hot weather if you run hot. Tanya, thanks for the compliment.You wear your neckerchiefs with panache, and I hope you find just the right colours to add to your collection. Sweet, Suz. You are lovely. Thank you. Hope you find scarf inspiration from this post. Donna, you’re awfully kind. By all means post a pic of the knot, and go for the double wrap. Thanks, Merwoman. You ARE set. Fun and enjoy. Laura, HAH. There you go. April, you’d look fab with a headband. Beth Ann, a larger square scarf is a great idea. I hope you find just the right one. Jules, wrap the scarf once. Joy, YES. I remember your wet scarf trick. Great tip. Hope to see you in necklace and neckerchief soon. Carla, hope to see your scarf and necklace look too. Yay, Lisa. High five, thank you, and lets see your scarf look on the forum. Lisap, I was wondering when someone would notice the matching backdrop on the painting. Well done! Thanks for the compliment, and only ONE neckerchief for you. For me too. Ryce, you’ll get used to the tie on the bag – promise. It will take less than a day. Diana, that works just fine. Creative. Thanks, Ledonna. And you’re covered. Nice tutorial! I have a silk navy foulard pattern scarf that I picked up at Banana Republic. Not a square though…..it’s a skinny one already in “worm” shape. I haven’t been able to make it work on my neck thus far….something doesn’t feel right about the look for me. Perhaps I’ll try it on a handbag. Like Lisa, I won’t be purchasing more than one. 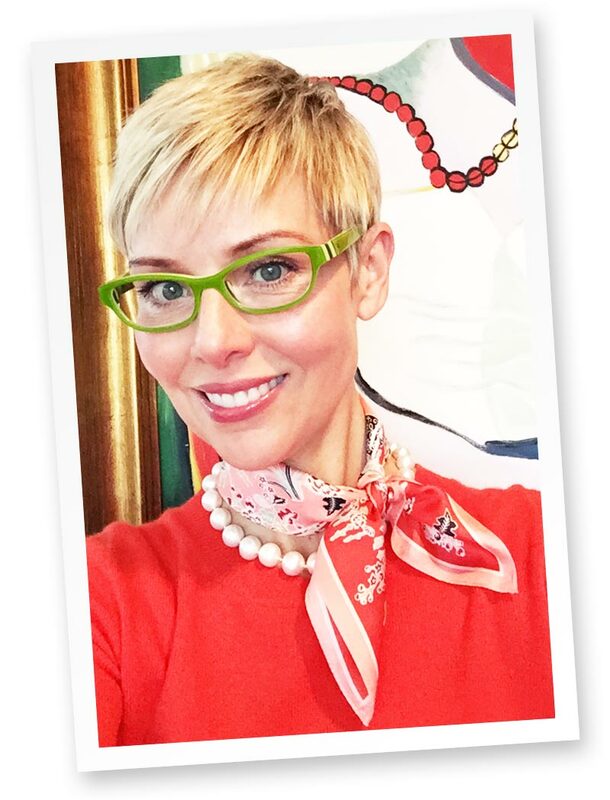 Angie…..What do you think of these skinny neckerchiefs (33.5″ x 2.75″) worn around the neck like an untied bow tie? I’ve seen this look on women. It’s one that Kelly of Alterations Needed wears sometimes. I like the wrist option as I’ve never seen a scarf used that way before. Otherwise, I’ll tie to my bag. I LOVE neckerchiefs. I haven’t figured out a way to keep them on my head. I will have to wear them more on my bags. I really like that. Fun inspiration! I like the wrap look for the neck and the headwear versions the best. That’s such a pretty scarf! I’m looking forward to trying these when it’s a little warmer. Right now I want a warm scarf around my neck. I have so many silk neckerchiefs – they were a staple for me in the early 2000s. I’ve been feeling this vibe and wearing them a little more often recently. I used to use them as headbands but I’m not sure it was ever a good look on me. HA! The other thing I wanted to say…..I really wish I could wear a head scarf without feeling weird. I have two girlfriends who have short hair – not pixies, but not a bob either) who wear them and it looks so cool! I’ll have to get out my old square silk scarves and try these ideas. Thanks, Angie! I wear neckerchiefs cowboy style to ward off mosquitos when I hike in spring. You look fab in your silk neckerchief and pearls. So beautiful! I just discovered your blog a month ago. I only have one small square silk neckerchief that I use quite often. I like using #1, 3 and 5. Thanks for the information. This does really suit you! I LOVE neckerchiefs because they keep my neck warm and aren’t in danger of becoming accidental bibs like larger scarves. I just noticed that Nordstrom.com has a lot more than last time I checked; I plan to order a few during Triple Points Days later this month. I’m also feeling that cotton scarves fits my casual style more than silk/silky ones, but I don’t like cotton with work clothing. This can easily double my *needed* scarves. I may need to rethink this aversion. I like the idea of a smaller scarf and classic tie but get nervous about wearing it myself because it can feel too…fashiony-contrived on me. Maybe it’s the environmental norm problem, or perhaps would work dressed down for casual- de- fashionizing the dressy scarf. Love this tutorial. I like scarves and find they add interest to my outfits. That is a great photo of you Angie. Thanks you so much for this post! I have a couple silk squares and wasn’t sure what to do with them. One is small and one is slightly larger so I’m hoping I can try several of the ties you describe above. I’m very excited about this trend (of course, it has to do with scarves;-) and will be trying several of these asap. While I look for a fun smaller scarf, I’ll try the longer length versions first as I have those types of scarves already in my closet. You look absolutely radiant, Angie, and the scarf + pearls combination is super fab! You look amazing in your neckerchief and pearls! 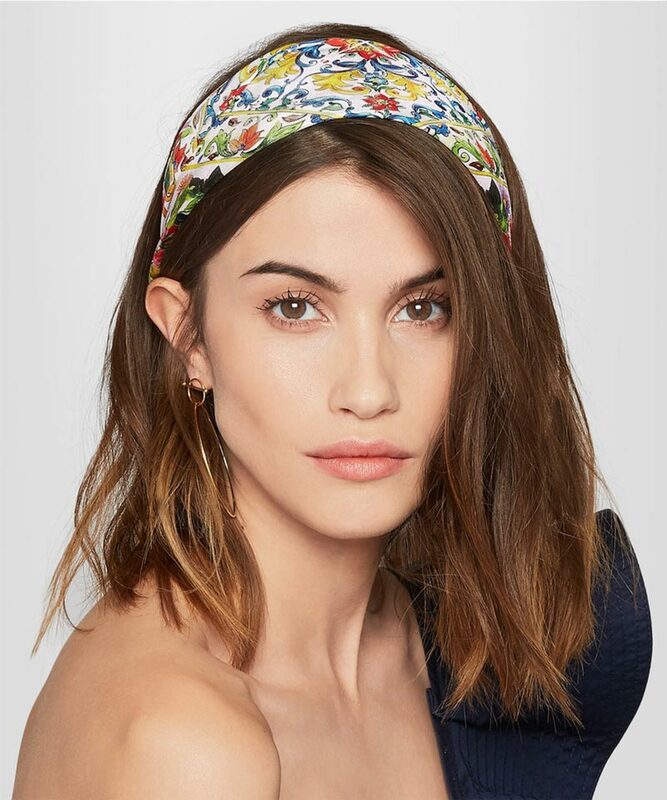 I like this look but I worry — does this mean my whole (custom-made with special hanging arrangements for scarves) closet full of bigger scarves is now passé? Oh, this is helpful! I’m sure I have a few scarves tucked away that I can pull out and experiment with. Thanks for the inspiration, Angie. You look as beautiful as ever, btw. Radiant! Last time I accessorized with the cowboy neckerchief I was 5. Wore it with my cowboy hat, chaps, gun belt and boots. My six guns dragged my gun belt low, and my cowboy hat came down over my eyebrows. Didn’t care. I felt tough. Rugged. A cowboy. I miss that outfit. Maybe I’ll revisit the cowboy. I had a look in my summer scarf drawer in the weekend and have four simple square scarves. I prefer mine the classic way, with a short neck it works the best. I would consider wearing one on my wrist too – I can’t quite carry them off on my hair sadly. I love the colour of yours Angie. Such a great post! Thanks for the tutorial and photos of each option. I’ve never felt confident or adept at the whole scarf/neckerchief thing, but this inspires me to give it a serious try! Thanks Angie. You look so pretty Angie! At first I thought, no way is this not for me, but then I got to thinking that it just might be perfect for summer. I’d prefer a much more casual look so I knew it’d have to be cotton. J Crew to the rescue. Their cotton bandanas are so lightweight. I picked up 2 today. I think it’ll be a great way to give some structure to summer tees. Here’s hoping it doesn’t feel too hot! I saw a chef with a very appealing, bright orange bandana tied in a way I never could replicate: imagine that there is a loose knot, with two tails coming out of it—like a bolo, or like it had a scarf holder where the knot was. I should look for images and see if I can add one! I’m not a fan of the classic or cowboy versions, but I do kind of like the others. I have a few vintage silk scarves inherited from my mom and grandmother that could be fun for this. This is a very helpful post. I’d love to find a scarf to use as a headband. Sometimes I need to pull my hair back, but it gets old using a barrette to do so. I could see a scarf being a very appealing alternative. If I had a long neck I would try the cowboy tie. Alas, I do not, but I think your neckerchief looks wonderful on you – retro and current! I like them tucked into the neckline of wool sweaters, they keep my neck from getting itchy and the sweater’s’ neckline clean. My issue with scarves as hair items is that they almost certainly will have to be ironed before you can wear them any other way. Marilyn, I like the small and short skinny scarves too. Is that the style you bought? glad the connotation seems to have relaxed. I love this! 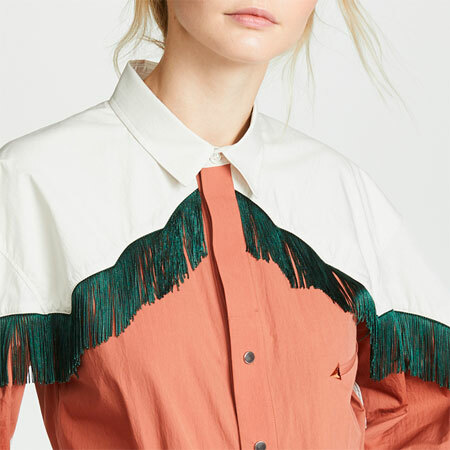 Great timing as I just bought a neckerchief to try out this trend. Thanks for the tips! I have been wearing smaller scarves a lot until someone mistaked my vintage Outfit for a Train stewardesses’ uniform and asked me something about the Train schedule in the middle of the night. When I replied I didn’t know, as I wasn’t an employee of the Train operating Service, the Person got very unpolite. Since then, I’ve only worn it in a western-y style context (with black Jeans Shirt), which is very, very rare. Is it just me or do scarves like These always have a very preppy, uptown-girl sense of style? Classically Casual and Vivien_noir, I don’t have the same associations, which you’re perceiving as negative it seems. kkards and Mac, please don’t feel choked! And sit this look out. 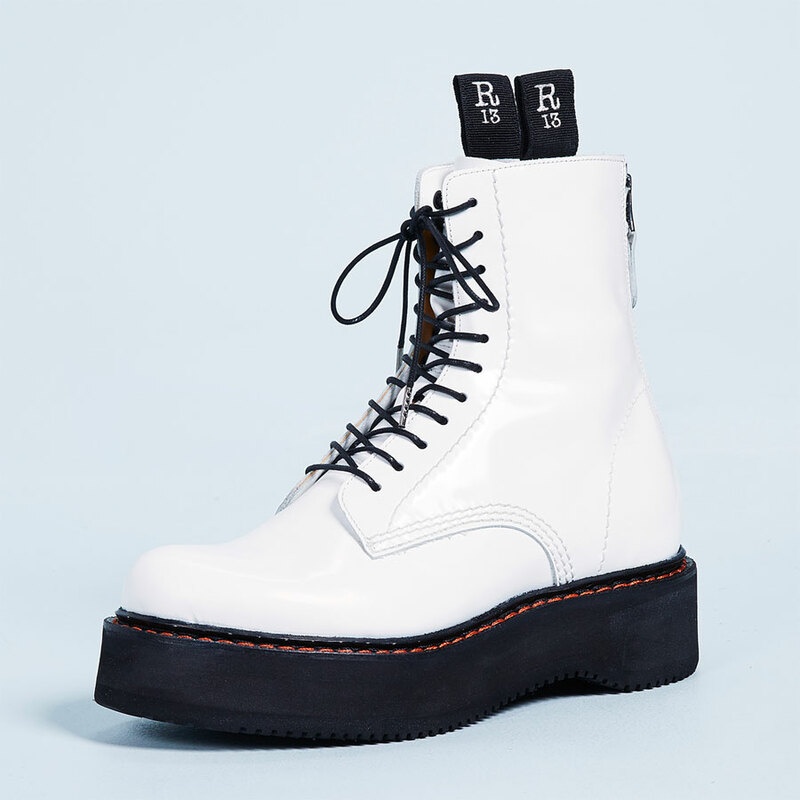 Love these to the 6th Power!!!!!! I’ve worn my square in many of these same ways. The second scarf is so beautiful in design. I really appreciate you sharing these wonderful and simple ways to enhance our outfits and also the practical aspects of silk and cotton, with the latter being better for use on the hair. Had to come back to say that it seems I culled the few neckerchiefs I had. But I bought one today, so I’m set! Great post I like neckerchiefs and have many of them.